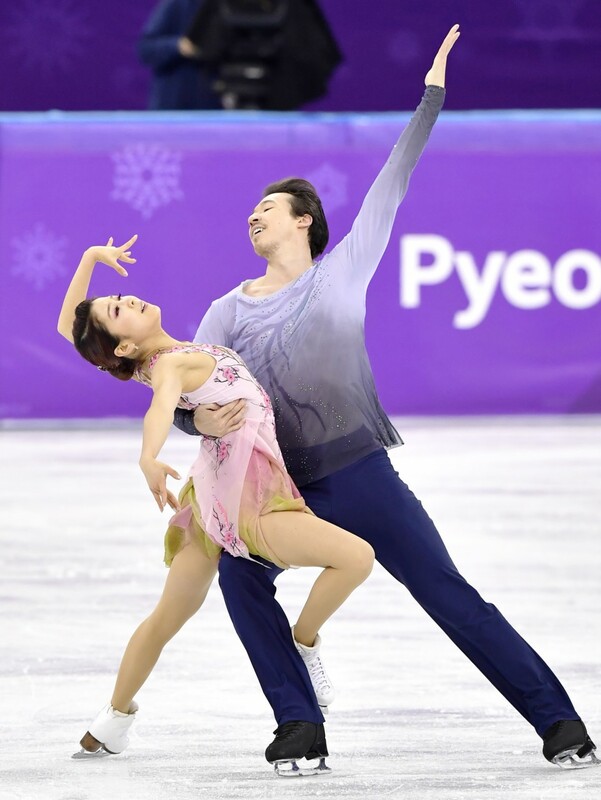 Since I started out with the short dance dresses, I want to go back and note a few changes in the individual ice dance event short dance from earlier in the season and take a quick look at the free dance. Kavita Lorenz returned to her sunshine fringe! I was so happy to see it again. It had the addition of gold beaded straps around the sides and back. I am usually in total agreement with Carol Lane whenever she does one of her (rare) shout-outs for a great dress. She and I were on the same page for Sara Hurtado. And not a sequin in sight. Kaitlyn Weave came out (to quote Carol Lane) is a “bobbiedazzler” of a dress and that about sums it up. I was sad to see her other dress go and I don’t know if I am entirely on board with this new outfit (is it red AND pink?) but it certainly popped. Madison Chock took a turn in a great new dress. She was like an exotic bird. I think it could have held back on the fringe but it was a winner with the colours. Tessa also returned to her original short dance dress for the season. I sort of missed the one from the team event but she and Scott still looked great. Interesting to note, there were some changes for the men too. Cizeron brought us some illusion mesh and sleeves (glad to see he seems to be taking his part in this costuming a bit more seriously); Zach did some no-so-basic-black (nice sequins! ); and Luca brought us some leopard print (sort of), which was better than his turtle neck from earlier in the season. Lauriault/LeGac kicked off the free dance and I have to say, I quite enjoyed it. She has pared down her costume a bit from what she wore earlier in the season. (She made the change at Europeans and stuck with it here.) I liked the first dress but I think like her fish tale, it was maybe proving problematic for the whole dancing part of what they are doing. I like the subtly defined waist in her new dress. 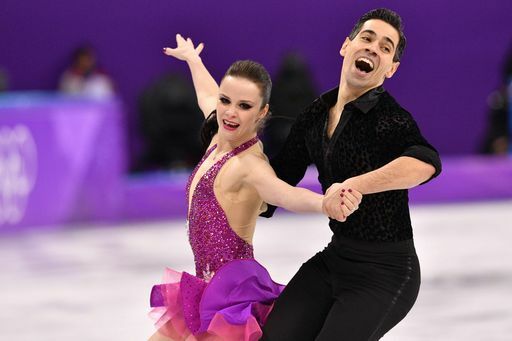 Sara Hurtado continued her reign of good taste and getting it right the first time with her free dance dress which has been great all season. I think they both look perfect for their Don Quixhote program. Anna returned to her good dress, her red dress, thank goodness. I was very upset when she turned up in the wedding dress for the team event. I don’t know what to say about Kana Muramoto’s dress. She made this change at 4CC and continued with it here. I am not a fan of the mid-program costume change. I don’t think it was necessary to the program and if you can’t convey the idea of your program with the music, ice dance and one costume alone there is a problem. However, I don’t hate the dress. It’s quite nice and the green is a good touch. And it was beautiful program. Still, I think, a bit much. It doesn’t help that I’m trying to decide which stage I prefer, 1 or 2. Most of the dancers continued on with what they have been wearing at competitions up to this point throughout the season, the notable exception being the Canadian ladies. Piper’s new dress makes sense since she and Paul were skating a new program. 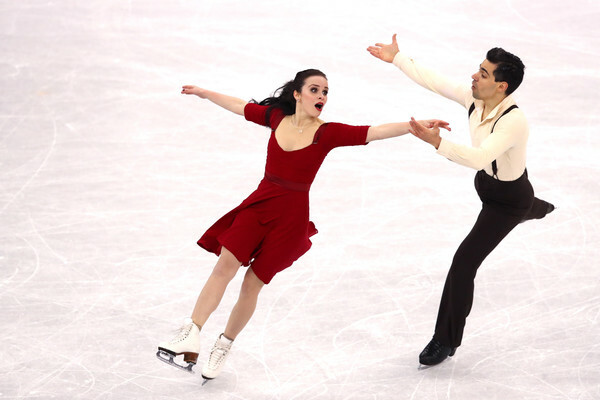 (Her dress at Nationals, where the program debuted, was a slightly revised version of a dress she had worn for the first program). I can understand too why Kaitlyn might want a new dress having worn this dress for the first time during the 2011-12 season. I loved Piper’s chartreuse; I wondered what Kaitlyn was thinking at first (it seemed half flaps and half sequined shorts) but it worked surprisingly well on the ice. Tessa was a delight in both her free dances. I found the progression in her free dance dresses interesting this year. They were certainly all variations of the same theme. I thought the dress first won at Skate Canada was perfect. It looked… luxe. And then she took it up another notch. Her third dress was divine. It was absolutely, spot on, gorgeous. It twinkled! The collar! She looked fabulous on the ice. Oh, you two! That’s another story altogether.